Silver graphite contacts possess very high resistance against welding at closing and when contacts are closed in case of short circuits. The welding resistance increases with the concentration of graphite but also the amount of electric wear. Silver tungsten and silver tungsten carbide contacts possess a very high resistance against electric wear and contact welding. 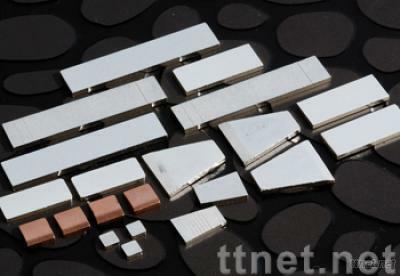 Due to the formation of tungsten oxides and tungstates on the surface of silver/tungsten contact materials, contact resistance will increase during the switching life time. Silver/Tungsten Carbide is more favorable in this respect. With a small amount of graphite over temperature performance can be additionally improved. Copper tungsten contacts consist of copper/tungsten and copper/tungsten carbide. Electrical Components & Equipments, Electronics Manufacturing Materials & Supplies, Electronics Manufacturing Materials & Supplies/n.e.s.